Image of a first edition copy of George Alfred Townsend’s Tales of the Chesapeake, a collection of short stories and poems about the Maryland shore. Published in 1880. 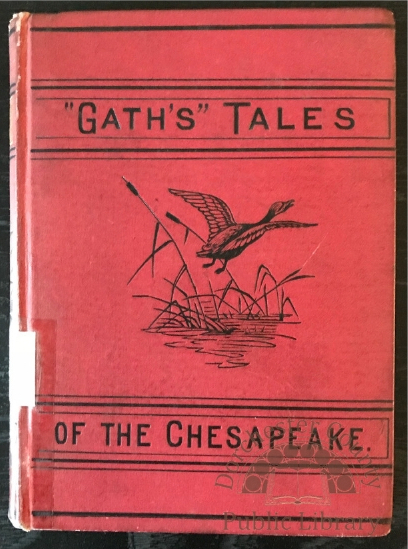 Tales of the Chesapeake by George Alfred Townsend is a 138-year-old collection of stories and poems about the Delaware and Maryland shores. At the age of thirty-five, Townsend, or GATH as he often used as a penname, wrote Talesafter re-visiting the Eastern Shore where he spent time as a child. The book contains tales of the rural waterfront communities along the Chesapeake Bay (Wiebe 2014). The red, cloth-bound volume is one of just a few works for which GATH is still remembered. A prominent author in his time, GATH has today slipped into obscurity. Few people outside of the local region are familiar with his work, and even then it’s a vague recall (Hindes 1946, 7). He was born in 1841 in Georgetown, Delaware and traveled frequently throughout Maryland and Pennsylvania following his minister father to different parishes (University of Delaware 2013). It is this religious upbringing that historians believe contributed to the use of his most well-known penname of GATH. The moniker is Townsend’s initials with an additional H and a nod to the Bible verse II Samuel 1:20, “Tell it not in Gath, publish it not in the streets of Askelon” (Hindes 1946, 29). Before becoming a literary author, Townsend was the youngest war correspondent for the Civil War at age twenty-one (Wiebe 2014). He wrote columns for several newspapers, including New York Herald, the New York World, and The New York Times (University of Delaware 2013). His first book, Campaigns of a Non-Combatant, later re-titled Rustics in Rebellion, was published in 1865. The book chronicled Townsend’s experiences as a war correspondent on the Civil War battlefields (Miller 2012). He also published a number of titles in the late 1800’s about American politics: The New World Compared with the Old, Washington Outside and Inside, and Events at the National Capitol and Campaign of 1876 (University of Delaware 2013). Perhaps Townsend’s crowning achievement was the erection of the War Correspondent’s Arch. He purchased land in 1884 on South Mountain in northern Maryland (Maryland Department of Natural Resources, n.d.). Over the next decade he would design and oversee the construction of several buildings for his family to use. During an 1895 visit to the Antietam battlefield Townsend noticed the construction of monuments to honor soldiers. This gave him the idea to build a monument for the non-combatants, or war correspondents, who may otherwise be forgotten (Miller 2012). Townsend began drawing up building plans and within a year had raised enough funds to build the War Correspondent’s Arch. The Arch features the names of 157 fellow correspondents and artists who detailed every moment of the Civil War (Maryland Department of Natural Resources, n.d.). Following his death, the structure was given to the National Park Service to be cared for as a national monument and remind others of the civilians who risked their lives to bring news of the Civil War (Miller 2012). Townsend is considered “one of America’s most important journalists and novelists of the Reconstruction Era” (Maryland Department of Natural Resources, n.d., para 2) by those fortunate enough to know his story. Unfortunately, his legacy is only remembered by a few novels and a Maryland State Park. Tales of the Chesapeakeis one of the last remaining copies of his legacy. Hindes, Ruthanna. 1946. George Alfred Townsend: One of Delaware’s Outstanding Writers. Dover: Delaware Heritage Press. Maryland Department of Natural Resources, n.d. “Gathland State Park History.” Accessed October 9, 2018. http://dnr.maryland.gov/publiclands/pages/western/gathlandhistory.aspx. Miller, John. A. 2012. “’Tell it not to Gath’: A Brief Biography of George Alfred Townsend.” https://southmountaincw.wordpress.com/2012/01/29/tell-it-not-to-gath-a-brief-biography-of-george-alfred-townsend/. Townsend, George. A. 1880. Tales of the Chesapeake. New York: American News Company. University of Delaware Library. 2013. “George Alfred Townsend Collection.”Last modified October 31, 2013. http://www.lib.udel.edu/ud/spec/findaids/townsend.htm. Wiebe, Dianne. 2014. George Alfred Townsend and Gathland: A Journalist and His Western Maryland Estate. Charleston: The History Press. This entry was posted in Uncategorized and tagged Academic Service-Learning, Chesapeake Bay, Dorchester County Public Library, George Alfred Townsend, Hidden Heritage Collections, Maryland Room Collection, Tales of the Chesapeake. Bookmark the permalink.